The Greek collector Dimitris Daskalopoulos is known not only as the owner of one of today's conceptually strongest collections of contemporary art but also as one of the most influential personalities on the current art scene in general. 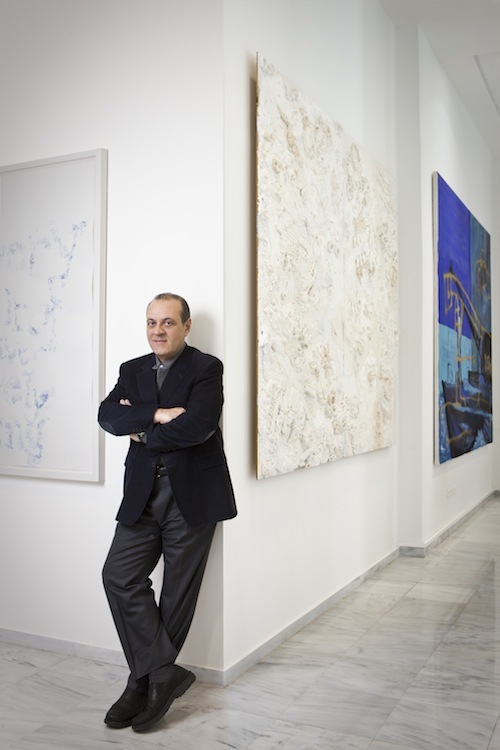 A visionary and philanthropist, Daskalopoulos is on the board of trustees of the Solomon R. Guggenheim Foundation as well as on the International Councils of New York's New Museum and Tate International. 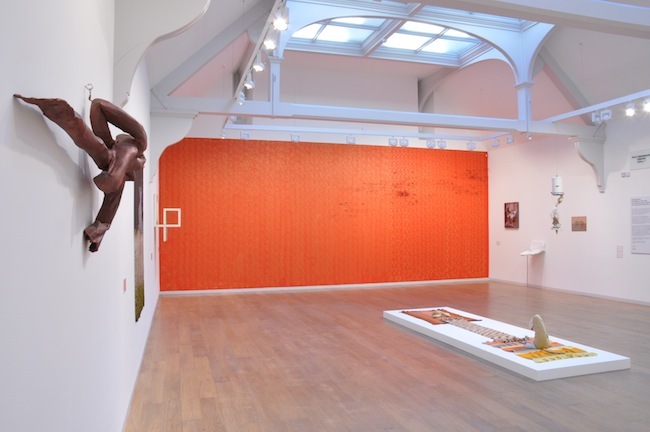 He is also a founding partner of the Whitechapel Gallery Future Fund. In 2013 Daskalopoulos created a non-profit cultural organisation called NEON, whose goal is to support and promote contemporary art in Greece and particularly Athens. Even though Daskalopoulos' collection of 500+ works of art representing 170 artists from Greece and abroad (Marina Abramović, Robert Gober, Damien Hirst, Louise Bourgeois, David Hammons, Matthew Barney, Martin Kippenberger, Annette Messager, Mona Hatoum, Bruce Nauman, Ernesto Neto and others) might seem like a real “Who's Who” of the art world, the collector has never been one to amass trophies. The conceptual foundation of his collection has been influenced by the works of Greek philosopher Nikos Kazantzakis, who spoke of life as a “luminous interval” between birth and death and the human body at its centre as a “source of creativity and the vessel of existential, social and ideological struggle”. 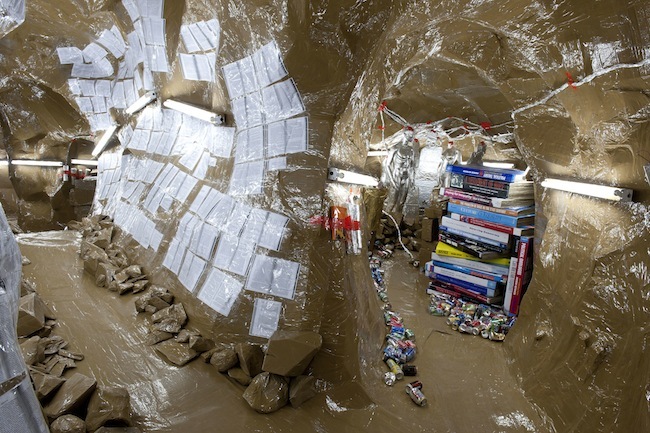 Large installations and sculptures make up the majority of works in the D.Daskalopoulos Collection, although it also contains drawings, collages, films and video. At 450 square metres, one of the largest pieces of artwork is Christoph Büchel's installation titled Unplugged (Simply Botiful) (2007). “My collection should not be perceived as a beautiful collection of contemporary art; rather, it is more like a message” says Daskalopoulos. The D.Daskalopoulos Collection is made available to museums and other art institutions and has been the subject of three thematic exhibitions: at the Whitechapel Gallery in London (2010-2011), the Guggenheim Museum in Bilbao (2011) and the Scottish National Gallery of Modern Art in Edinburgh (2012-2013). Born to a working class family, Daskalopoulos went on to turn his family's dairy business into Greece's largest food empire, Vivartia, and in 2007 he sold his share in the business. He says his passion for collecting began already in childhood, and his relationship with art began at age 12, when he spent two hours completely spellbound by Rubens' paintings at the Alte Pinakothek in Munich. At the beginning of his career as an art collector, he concentrated on Greek painting from the 1950s, and he only turned to contemporary art in the early 1990s at the age of 40. Daskalopoulos currently works in the investment business and is the president of the Hellenic Federation of Enterprises. We meet at the federation's headquarters in central Athens, but it took four months to arrange this meeting due to Daskalopoulos' extremely busy schedule. He comes out to welcome me at precisely twelve o'clock, and his disarming simplicity surprises me. Nothing in his office divulges the presence of a collector; it contains only a couple of paintings that are of a mostly decorative function. Daskalopoulos says he has more artwork in his other office, in Athens' Halandri district. But, as he later reveals over the course of our interview, he doesn't require art on a daily basis. Daskalopoulos sits down right across from me and speaks openly, slowly, deliberately and very constructively, as if he has already formulated his answers to most of life's questions long ago. But every once in a while his seriousness is interrupted by a spontaneous spark of humour that reveals a man with a very strong personality in which a strict businessman coexists with an artistic sensitivity. When speaking about your collection, you often refer to the Greek etymology of the verb “to collect”, namely, “to say something with....” What do you see as your mission as a collector and what do you wish to tell the world with your collection? I use the Greek etymology of the word because that was what I discovered I was doing when I was collecting. I was choosing artworks that speak with each other, artworks that carry the same central message and artists and artworks that can add to the exploration of this general message. My collection is actually very focused; it is very centred around the main issue of the human struggle and the human ability to create. The creativity of a being that has a very short life span and knows about the limitations and the short amount of time we have here in this world. But despite that, we are full of energy to create new things, to progress. These are the kinds of works I've always selected, works from artists who talk about this subject – the examination of human fragility together with human strength and creativity. And that's why the Greek etymology of the word “to collect” is very present in my collection. Are these the questions that are also very important for you in your own life? Maybe through collecting you are trying to find the answers? My business life has been one of constant progress. Sometimes you stop and wonder – where does this energy come from, where does it lead, why are we so motivated and committed? It's the marvel of human existence. That's what I really admire. Of course, my collection has an emphasis on fragility, which exists just to expose this marvel. Because it's precisely despite this fragility that we are so committed to the struggle – to create, to be, to leave a footprint, to leave something behind. The year 1999 was a sort of turning point in your collection. 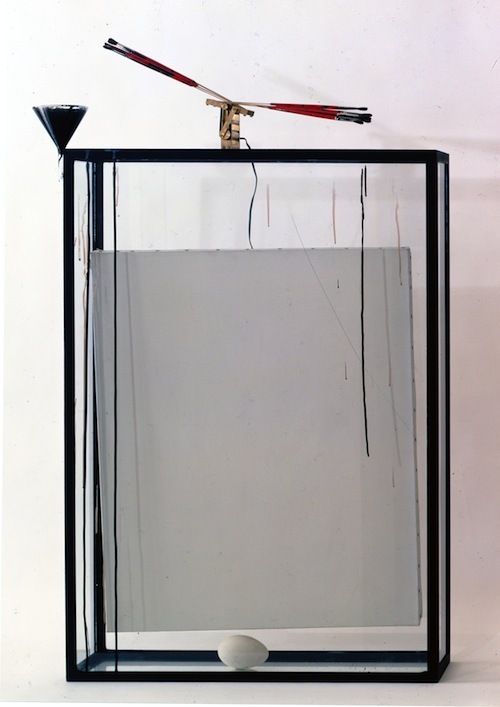 That year you bought a replica of Marcel Duchamp's original Fountain at auction for 1.76 million dollars. You now own the piece numbered 5. What captures you in this work of art, besides its iconic status? It was not a turning point in the sense of what my collection is trying to say. It was more of a turning point in the sense that the collection was already big enough and it was a decision, a fresh call, to move from being an amateur who likes and collects things to making a commitment to become a serious collector. It was a shift, an adjustment that I made myself. I said, “I can stop here, I can be happy as a person, as a collector. But if I go on from here, it will be something very big.” And I decided I wanted the collection to be big. And now, of course, ten years later this has all been realised. My collection is being asked for by museums, for exhibitions and is respected as something beautiful and for its central message. The first piece of contemporary art you bought was the kinetic sculpture The Painting in the Inner Egg (1993) by Rebecca Horn. That was also because it was a painting. It's an artwork that in a certain way does away with painting, an issue which has been very critical for me because I realised my love of art through painting, of course. Because that was easier in some way? Yes, because when you go to museums, you see great painting. Of course, you can't ignore the great history of beautiful art that has been done on canvas. But as I looked at contemporary art, I realised I was much more interested in what contemporary creativity can do with expanded media and what it can say about the world of today. In one sense, Rebecca Horn's piece was a symbolic gesture: a painting on a white canvas and an egg. In effect, painting was put away in an egg – in order to continue on. To continue towards other expressions of contemporary creativity. That's why there are very few paintings in my collection since then. I very often go to great museums and, as I said, what I see there humbles me. But that is exactly where the great paintings belong. Now you have everything in your collection, from big sculptures and installations to digital works. Does that mean that the most essential thing for you is the message, not the form? Well, it's definitely not the financial aspect, nor the easiness of looking at something, nor the pleasure of living with your artworks. Those things are much less important for me. When I display some larger installations, which, of course, are harder to find and see, and afterwards I go there and see the reactions of people, the emotions they create in people, that's what makes me happy. Much more than looking at a painting on my living room wall every day. That is the difference between you and another Greek art collector, Mr Dakis Joannou, who has a beautiful house full of artwork, which I visited just yesterday. You have no need to be surrounded with artwork in your everyday life? Is that not important to you at all? No, and that's why I keep saying that my collection, for me, is not an asset that I feel is mine in the sense that I want to play with it and show it off. I feel that I have an interest and the financial means to put together a good expression of the creativity of other people, and for me it's there to be shown, to be loaned, to be open to the public. And this leads to another activity of mine, which is completely different from collecting: the non-profit cultural organisation NEON (from the Greek word for “new” – U.M. ), which I established two years ago and whose goal is to expose people to contemporary art and its ideas, to stimulate them to think and to rouse in them the emotions that can be brought about by contemporary art. NEON is completely unrelated to my collection, and that's also the reason I'm not planning to create a special space to exhibit it. And that's despite the rumours in the media that you're looking for a permanent space to display your collection? No. My collection is a repository. It's available to museums, for loans, and I give it out as much as I can. The NEON organisation is about helping people to come in contact with contemporary art. And I feel I don't need my own space to do that. There are public institutions, there is public space available and initiatives by other people, and I support those, as well as instigating my own. So, one of the things we've recently done is to announce an important support program for the National Museum of Contemporary Art, which will open here in Athens this autumn. Also several education programmes, etc. NEON also supported the Martin Kippenberger show at the Museum of Cycladic Art earlier this year (Oct 2013). 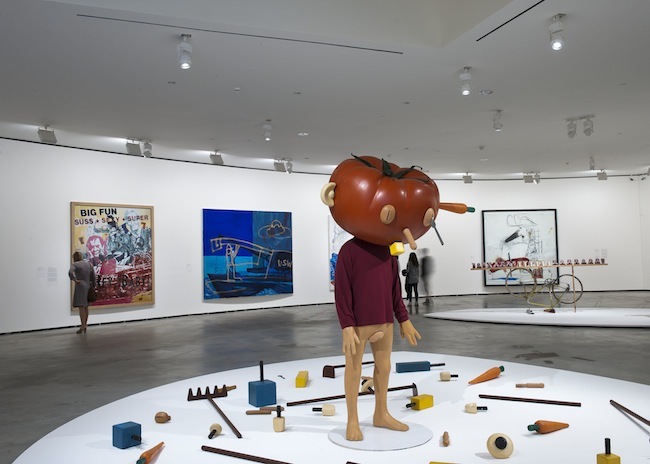 Yes, we proposed a solo show of Kippenberger’s work to include it in their contemporary art programming. The Museum of Cycladic Art, has done a good effort of putting contemporary art in the museum. We are now doing an exhibition at the Gennadius Library, which is a very beautiful building in the centre of Athens and has a beautiful garden. It will be an indoor and outdoor exhibition. 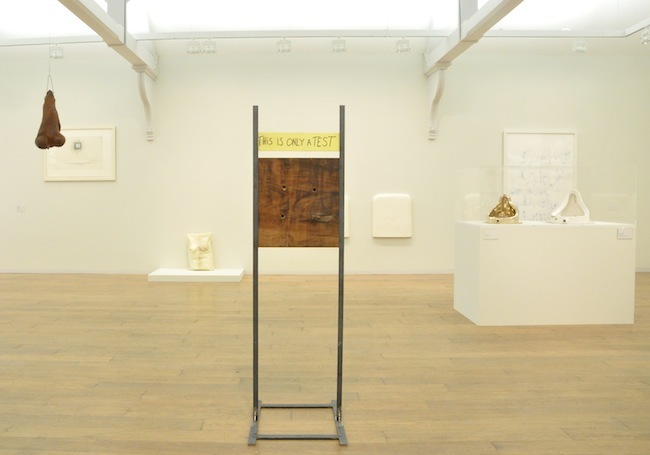 (A Thousand Doors exhibition from May 4 to June 30 is organised in cooperation with London's Whitechapel Gallery and will focus on sculpture as a gateway to a journey in time as well as a stimulus for scientific and philosophical discourse and for the creative world. – U.M.) And there are a lot of interesting activities and also a great debate about what should be the use of the public space and how art can be part of it and engage the public. This is because we made a proposal for an exhibition in the National Garden in Athens, and there are instrumental and healthy discussions going on about this issue with the authorities, the public and independent interest groups. Before, a lot of people were against it. But I feel that in the end this project will succeed, because people want to see art, people see the benefits of having access to these works in a public space. Both for themselves, for their families, for their education and also for the city. Of course, there is always a debate when you go out into the public space and try to do something. Everybody has an opinion. And many of these opinions are opposed. Yes. And that's why I'm saying that in the end this project will happen. Years from now, I see this city as having many institutions and public spaces adorned with contemporary art. And I hope to be able to say that I had something to do with it, that I pushed it forward. In this sense, it doesn't really matter if the specific exhibition at the National Gardens takes place this year or the next. You have called the current economic crisis more of a crisis of civilisation. Yes, and a cultural crisis. I heard the shocking statistics that in Greece only 16% of the people go to museums.... How can this be in a country with such deep cultural traditions? It's because we've taken our cultural heritage for granted. And that is the reason why contemporary art is even more important in terms of influencing our culture. We were great achievers historically – in art and creativity, in philosophy and democracy – but we are now living in the 21st century. And if we want to live better and prosper in our own time, we have to create the circumstances for it in this century. For me, culture is fundamentally important in this process. Especially given the fact that we have such a great history, which is embedded deep in our souls. That's why we don't have a need to go and see it, because it is inside us. In your blood and genes? (Laughs) Yes, we have the direct bloodline of Phidias, who built the statues for the Acropolis. We feel that we have historically done everything in the realm of culture. But nowadays – if we are able – we need to become relevant, creative and special again, in the culture of today. We cannot just carry the laurels of a great past. That's not enough for us. And I must say, there is a lot of creativity and a lot of innovation going on in this city, and what we need is to just make it a part of everyday life. Much more than it is today. Do you think art nowadays has the power to change something in society? Yes. Not art in and of itself, not a specific work, not a specific exhibition but the fact that somebody will become exposed to – and maybe obsessed by art, will try to understand, will speak with his friends and his family about a new idea, sort of squeeze his mind in a different way, outside of the routine. That is the value of art. Is it important for you to meet the artists whose works you have bought or are thinking to buy? No, I do not see it as a prerequisite. Because, you know, I seek the power in the artwork itself. I have a very sensitive mechanism here inside me (points to his chest – U.M), which responds very strongly when an artwork touches me. Of course, I respect the personality of the artist. If somebody can make a powerful piece of art, obviously there is something in this personality that is interesting and powerful. But I don't need that, because the artist is making the artwork and then, later, there is time to let the artwork itself speak. And if the artwork speaks, we don't necessarily need to have an extra debate with the artist. Because a powerful piece of artwork has a life of its own. Inside each one of us. And inside each one of us it is different. We all react differently to an artwork. We all interpret it in a different way, it means different things to us. A powerful artwork doesn't need an artist to be present to explain it. Could you name the most powerful artwork you have seen or bought recently? An artwork that has truly moved you, touched you or shocked you despite your undeniable great experience with art? From what I've seen recently? Did you read my story about Éxtasis de Santa Teresa by Bernini, I suppose? Yes, but this time I'm asking you more about contemporary art. (Laughs) This piece of artwork is always there and troubles my mind. It's actually a masterpiece of expression. But from what I've seen recently? I had a very nice time at Matthew Barney's show at Haus der Kunst last week. A really good day with art. You also have Matthew Barney's works in your collection. What fascinates you about his art? Are you planning to buy something also from this exhibition? You were selected to be on the board of trustees of the Solomon R. Guggenheim Foundation in 2009. What are your duties and role as a trustee? The trustees are basically responsible for overseeing the management, finances and programming of the museum. Of course, we are very happy that Guggenheim has a great management and curatorial team, and what we've done in the last two years mainly concerns refreshing the strategy and vision of the museum, bringing it up to date. To provide better answers to the challenges of a modern institution, which are how to survive financially and how to attract the public. That is basically the job we are doing. The most important thing that has happened to me during my time at the Guggenheim is that I was appointed chairman of the collections council last year. Our task is to evaluate the museum's current collection and fill holes that have been left empty as well as create a strategy for the museum to retain its current status as a museum of contemporary art, both today and looking towards the future. And that's a very interesting and difficult exercise. 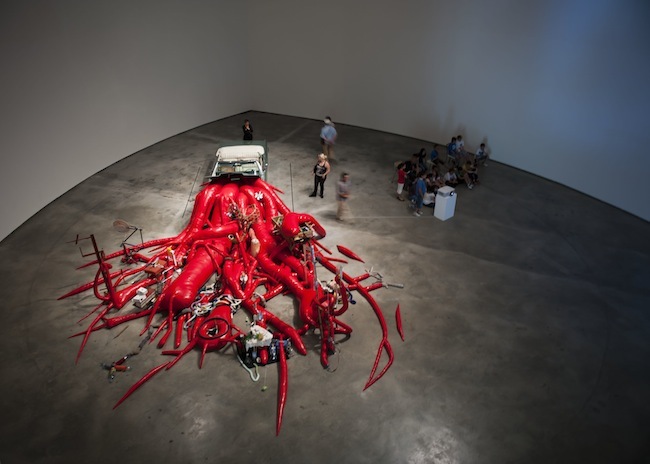 Several years ago an exhibition of Dakis Joannou's private collection at New York's New Museum, of which he is a trustee, provoked a big dispute. This incident was also mentioned by the media in connection with the exhibition of your collection at the Guggenheim Museum in Bilbao. Do you think an exhibition at a museum increases the value of a collection? And how important is it even to look at such a situation from this viewpoint? As you may have heard, this controversy ended quickly, because it had little substance. Do you think it was just a media bubble? Yes, a fancy of the media that didn't have much substance to it. I mean, the discussion did not last long, because, in the end, we come to the reality that art and money have been unavoidably and inextricably linked throughout history. Everything happening in the artworld has a financial effect. Historically, public and private initiatives - and money- have been constructively linked in art. Why was there an issue about a private exhibition in a museum, when every day we have private and public exhibitions on single artists and private exhibitions promoted or supported by gallery owners? We have large museums and serious museum directors who have a lot of power and whose every decision has a direct or indirect influence on the market. We have auction houses. As I keep saying, this is the most organised and at the same time the most unregulated market that exists in human economics. There are no rules; but, on the other hand, it works: intelligent people exchange real money. Value is kept. It’s a marvel. It's a big industry. So, in trying to pick out the things that might influence the value – yes, everything influences the value. I believe that the shared and common role of public and private undertakings in art is to make artistic creativity possible, to contribute to the critical discourse that promotes good art over lesser art-thus creating value, to preserve artworks, to expose them to the public in a meaningful way. They each contribute to this in their own way and their evaluation depends on the success of their efforts as judged -followed or rejected- by the public. Speaking of the relationship between an artwork's value and price. Is there a correlation between the two, and how important is it? Hasn't the irrationality of the market turned some of the artists into manufacturers, by pressing them to create more and more artwork? I think Michelangelo would be complaining as well. And Mozart, who was asked to write one symphony for this emperor and another symphony for that aristocrat.... But in the end, we are left with some masterpieces that we love to hear. Of course not, but time makes the distinction quite accurately. Speaking about time, what do you think – how many artworks from your collection will pass this test of time? Especially as there is an opinion that most of the contemporary art we value at the moment will become historically insignificant in the future and end up as garbage. Yes, a lot of what we buy is real garbage and won't last anyway. But I'm not looking very seriously at conservation issues. I don't mind if an artist makes a work that is designed to be flimsy and temporal – that's fine with me. If I buy something and then, five or six years later, it doesn't exist anymore, that's not a problem. I have a lot of artwork by artists who did not develop further or did not become very famous, but I still have absolutely no regret about buying anything. I remember a work that I bought 25 years ago by a Luxembourgian artist that I never heard of again. But I'm longing to see it in an exhibition because I think it is a great work of art. So I think that would be my message to anybody who thinks that art collecting can be done as an investment. It cannot. If you are passionate and create a collection, you may be lucky and have your good moments of great revaluation. But overall, collecting is mostly about the love with which you put things together, and in the end it's an investment like all others – with very long and very average returns. Have you sold anything from your collection? I've only sold about ten pieces over the course of twenty years. Especially when I decide to move on with an artist and in that way I get better works by that artist. Or purely conceptually – some of the artists I paid attention to when I began collecting are no longer significant now that my collection has become larger and more established. Otherwise, I do not trade in art. How have you trained yourself to distinguish good art from bad art? Some collectors have told us that this is a lifetime process. You get better and better all the time. But in the end, I think it's something in here (touches his heart – U.M.). I think we all make mistakes and there are better collections and worse collections, but in the end it's the collector's ability to decide between things. It's more important what you reject, rather than what you buy. How many artworks from your collection are loaned to museums and other art institutions at the moment? Right now, I think there are 20 artworks out at museums and exhibitions. I guess we give at least 15 to 25 loans a year (excluding the D.Daskalopoulos Collection shows which included approx. 60 works each). My collection has enough to allow many different curatorial approaches and interpretations. If your collection is more about the human life span, this short period between life and death, is it important for you what happens with it after you will pass away? Yes. Especially because, as I said, I don't think the collection belongs to me alone as an asset. I think it belongs to the artists, to the public, to the world of ideas. And it should stay there somehow, to create a reaction. I think the future of my collection is clearly associated with public institutions. But which ones – I have yet to decide. However, I think a collection is clearly associated with and lives because of the passion of its creator. And when you are no longer there, the collection is also not there anymore; it becomes a time capsule of the past that nobody can keep alive. It'll probably be better to put it back where people can see it. At least some of the artwork. When you buy a new piece of artwork, where do you look for it? In auction houses, artists' studios, galleries...? Yes, but there so very much game out there, millions of opportunities to hunt and acquire. And, you know, anyway you will only get a very small part of it. Therefore you shouldn't worry so much about if you've missed something or have not gotten the best price, or about whether you've prevented someone else from getting what you've desired. In any case, no matter what you do and how much you can invest in art, you are only making a small imprint in some little corner of this huge universe of creativity. It's a matter of luck, and that's also the fun of it. I have had works offered to me that I didn't buy and now I want them, and I have works that I know other people would have killed for that in the end went to me, but that's the reality. Do you take advice from art consultants? Yes, I have a small team of people. We talk, we go through the collection all the time. We find the central themes, we make lists of artists that we need to explore. We evaluate the artists represented in the collection from the standpoint of which works from specific periods of theirs we may still be lacking.... And then, you know, one day you go out and there is something sitting in a corner and you think, “Perfect, this is for my collection, I will get it.” No discussion with anybody. You know, the stomach is there and it functions all the time. That's why we get hungry after a few hours. It's the same with art. It stimulates a reaction in the stomach. The emotion that art can generate is everywhere here – in the heart, the lungs, the stomach, in the centre.... Or maybe it all happens in the unexplored and remarkable human brain, which we might call the heart or soul. I don't know. But I enjoy getting a reaction and I trust it. Is collecting in some way your refuge from business? I've collected art as passionately as I've done business. And I think it's been with a lot of success as well. Maybe the business was a refuge from my passion for art, who knows? Why do I assume that business is my main activity? I've done it all with a lot of interest, with a lot of love and passion. They're inseparable, these two worlds are a part of me. Do you still remember those feelings you had at the age of twelve when you first saw the Rubens paintings at Alte Pinakothek in Munich? I go there every time I'm in Munich. Whenever I go to Munich, I go to see The Fall of the Damned. And is the feeling still the same? Yes, and also Da Vinci's little Madonna at the other end of the room. It's like the whole wisdom of creativity; it reinvigorates the simple essence of being, like a refreshing swim and a cold Greek salad do in summer in Greece. I always go back to those paintings because they're the reference of beautiful, good art. They recalibrate your mind, because we see a lot of funny things in contemporary art today and it's good to see what has lived, what has survived from the past until today. To understand why and let it seep into you and become a criterion for when you are making decisions today about contemporary art. If you love it, do it. Otherwise go surfing. Is there any piece of art you wished you had in your collection but couldn't afford? (Laughs) Many things. I sometimes get a sinister urge to grab things from museum walls and put them in my pocket and leave. Don't you, too? As I said, there is so much good art and that's why it's good where it is. The work that created such a reference for me is the Bernini sculpture. I could look at it every day.